$499.99 for your internal use - this allows you to use this database template however you wish within your organization. $999.99 for unlimited developer use - this allows you to use this database template however you wish for any applications you develop and distribute. The Microsoft Access Mowing Lawn Care Database is a full featured database system built all in Microsoft Access tables, forms, reports and VBA (Visual Basic for Applications) code. Based upon some of the concepts of the Microsoft Outlook Calendar modules, this database template has the advantage of being 100% Microsoft Access based. This allows for smooth and easy integration into your existing Access database. The Microsoft Access Lawn Care Database includes the ability to setup customers, schedule appointments, print invoices, and record payments. The database also includes a great calendar feature which offers a daily, weekly, bi-weekly, and monthly view of all scheduled appointments/meetings. 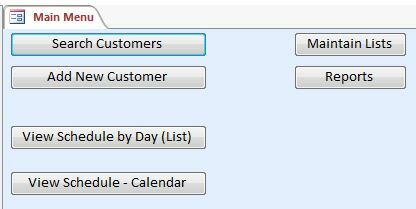 The calendar feature has a form for setting up and maintaining appointments/meetings as well. Pre-built daily, weekly, bi-weekly, and monthly reports are also included with the Microsoft Access Mowing Lawn Care Database.